In the wake of failed clinical trials based on animal models, the pain field is facing what seems to be an inescapable conclusion: the success of new pain drugs in the clinic will likely require studies of human cells and tissues. But human neurons are not easy to come by. 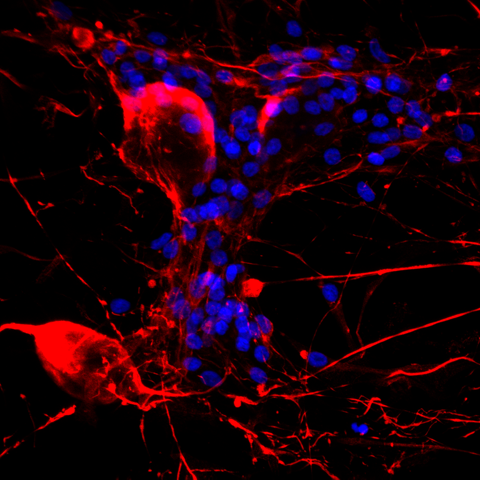 Recent work culminated in an invaluable resource: human sensory neuron-like cells reprogrammed from fibroblasts (see PRF related news story). Now, a handful of academic researchers have made the move to acquire and study native human sensory neurons by tapping into organ-donor networks to access prized dorsal root ganglion (DRG) tissue. Their work promises to help validate—or invalidate—important pain mechanisms discovered in animal models. “For years we have been working with transfected cells from animals and in animal models of pain, not under the assumption that things would be the same, but with the hope that they would,“ said Linda Porter, pain policy advisor at the National Institute of Neurological Disorders and Stroke (NINDS). This year, Robert Gereau and colleagues at Washington University in St. Louis, US, published the first electrophysiological characterization of DRG neurons from healthy adults (Davidson et al., 2014). 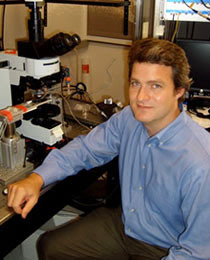 Gereau and co-first authors Steve Davidson and Bryan Copits made patch-clamp recordings from 141 neurons from five donors, focusing mainly on small neurons, which include nociceptors. The overwhelming majority of cells displayed a “shoulder” on the falling phase of the action potential, a feature that in rodent neurons defines them as nociceptors. The team also saw many cells respond to compounds that cause pain—adenosine triphosphate (ATP) and allyl isothiocyanate (AITC)—and itch—histamine and chloroquine. Also similar to rodent cells—and to the reprogrammed human neurons recently described by Clifford Woolf and colleagues (Wainger et al., 2014)—some human neurons became more excitable following exposure to the inflammatory mediators bradykinin and prostaglandin E2 (PGE2). Gereau’s team presented more recent experiments at Neuroscience 2014, the annual meeting for the Society for Neuroscience in Washington, DC, in November showing that neuronal sensitization by PGE2 was blocked by activation of metabotropic glutamate receptors (mGluRs). Gereau’s lab previously identified and characterized group II mGluRs as a potential analgesic target based on work in rodents (Yang and Gereau, 2002). Gereau had set his sights on moving toward clinical trials involving that target, but he wanted to test the pathway in human cells before making that leap. “It’s quite comforting to see exactly the same type of modulation in human cells,” he said. DRG neurons from humans had been previously studied, but only from fetal tissue or chronic pain patients (Valeyev et al., 1999; Scott et al., 1979; Baumann et al., 1996; Baumann et al., 2004). In a commentary accompanying Gereau’s paper, Sulayman Dib-Hajj, Yale University, New Haven, and Veterans Administration Connecticut Healthcare System, West Haven, US, said Gereau’s data “begin to establish a baseline and a benchmark” for more representative human neuron physiology (Dib-Hajj, 2014). To better understand the human sensory neurons, Gereau has future plans to use calcium imaging to study populations of neurons in the dish, and to genetically analyze individual cells following physiological characterization. With rare exceptions, sensory neurons cannot be harvested from a healthy person—neurons are not exactly a renewable resource like skin cells, nor are they so readily accessible. Many scientists simply assumed that human sensory neurons from the dorsal root ganglia (DRG) were out of reach, but through perseverance and networking, several groups have conquered the logistical challenges of procuring DRG tissue from organ donors. Gereau made the decision to pursue human neurons when he ran into his former colleague Andre Ghetti, now Chief Executive Officer for AnaBios, a for-profit company in San Diego, US, that procures tissues for research from organ donors. When a donor is identified, AnaBios uses qualified surgical contractors or sends its own team to retrieve needed tissues. Back in San Diego, they prepare the human cells for research using proprietary protocols. Operational since 2011, AnaBios has primarily served pharmaceutical companies. Gereau was the company’s first academic collaborator, and Ghetti told PRF they are now working with a growing number of academic labs. Dib-Hajj and Stephen Waxman are also working with human DRG neurons, which they obtain from the nonprofit National Disease Research Interchange (NDRI). NDRI works with 56 of the 58 US federally designated organ procurement organizations, or OPOs, to obtain donor tissues for research and to get them into the hands of researchers. NDRI works with researchers to develop a plan based on the lab’s specific aims and then acquires the appropriate tissues. 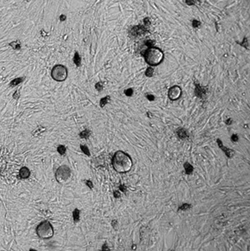 Researchers are responsible for dissociating and preparing cells for experiments. That is a project in and of itself, said Dib-Hajj. “Even if you can get the tissue, it is a lot of work to get functional, viable cells,” he told PRF. Dib-Hajj and Waxman have not published any results yet but presented some preliminary findings in a poster at Neuroscience 2014. Their data suggest that species variation in voltage-gated sodium channels cause marked differences in action potential profiles between human and rodent cells. Michael Gold at the Center for Pain Research at the University of Pittsburgh, US, has just wrapped up a year of intensive experiments on human sensory neurons. Gold obtained the cells by working directly with the Center for Organ Recovery & Education (CORE), a US federally designated organ procurement organization, or OPO, that serves the 155 hospitals in Gold’s west Pennsylvania region. Gold and his team trained technicians from the CORE tissue recovery team, who then extracted the ganglia and handed them over to Gold’s lab technician to dissociate and plate the cells for experiments. When preparing neurons in his lab, Gold adapted his protocol from that used by Thomas Baumann at Oregon Health and Sciences University to isolate neurons from pain patients who received a ganglionectomy as a last resort treatment. Gold worked in collaboration with Eli Lilly, who funded the project. Inspired by his experience working with the human cells, and by Gold’s success at getting human tissues locally, Gereau has also forged a relationship with a transplant service in his home town of St. Louis, so that human neurons will become “a more standard resource” in his lab. All three groups had access to donors’ medical records, with varying degrees of detail. While the initial focus has been on studying cells from healthy donors, the researchers eventually intend to investigate neurons from patients with chronic pain conditions. At what cost? Gereau said although he knew that cells had been available for several years, he believed that he could not afford human cells in his academic lab. “But I could. I just had to work it into my funding concept.” Porter encouraged pain researchers to follow Gereau’s lead and write grants for funding to study human cells, which face no particular hurdles at the NIH, she told PRF. What kind of funding is required to get human DRG cells? Of course it is illegal to buy or sell human tissue in the US, but there are significant costs associated with the cells, from the specialized team trained to extract the ganglia to the courier service used to transport the tissue. Thomas Bell, Director of Scientific Services at NDRI, estimates the cost of a pair of DRGs at $1,200, plus several hundred dollars in shipping costs. “It is absolutely our goal to make this resource as affordable as possible so that any lab can use it.” Considering the cost of animal housing, Bell told PRF, human cells might not be much more expensive than rodents. AnaBios’ Ghetti estimates their cost at a bit higher—perhaps several thousand dollars for a pair of DRG, each of which contains thousands of cells, although researchers end up patch-clamping only a fraction of these. Gold, who recovers four ganglia from each donor, said he typically uses one for studying physiology, fixes one for histology, and freezes the other two for genetic testing. Stephani Sutherland, PhD, is a neuroscientist, yogi, and freelance writer in Southern California, US. Image: Bryan Copits, Washington University. Human sensory neurons: Membrane properties and sensitization by inflammatory mediators. Pain. 2014 Sep; 155(9):1861-70. Epub 2014 Jun 25.